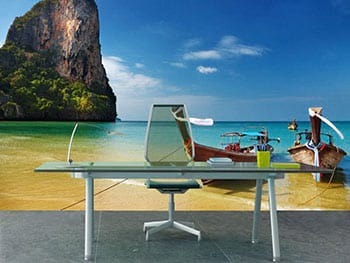 Wall murals give you the flexibility to choose whatever scene you would like. Whether it's a scenic nature image or your favorite travel location, choose the vibe you want to set for your space. Simply send us your artwork or work with our in-house graphics team to get exactly what you are looking for! If you are looking for something that might stand out a little more, acrylic signs are a great option. They are a modern and elegant way to brand your business. Print your logo or an image onto an acrylic base and our team will install the base right to the wall! Inspirational and motivational quotes are becoming increasingly popular in office settings. Choose your favorite quote, your core values or your mission statement to install on a wall or window to keep employees uplifted and motivated throughout the day. When installed professionally, it won't fall off or get crooked and will look professional for years to come! Custom logos and graphics making branding your company easy. 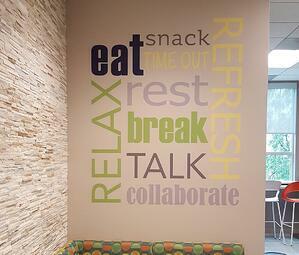 Install your logo on a door, wall or conference room to promote business and make employees feel like they belong. 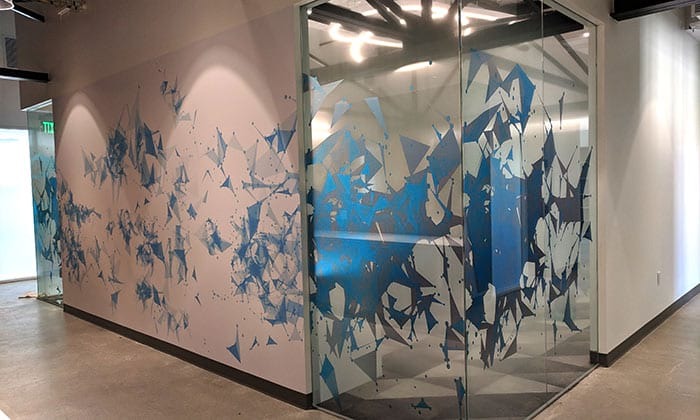 Decorative window film is a great way to create distraction on glass or increase privacy in a chic and modern way. Choose from a variety of designs such as stripes, frosting, and other geometric shapes to perfect your space and draw attention away from those bare white walls!